The Long Version: One year ago we were at a party and after a few too many whiskys I suggested to my friends that we “put the old band back together” but that instead of running sound, I would play bass. They called my bluff, and it’s been going great. But I still don’t have a bass amp of my own, and borrowing got old after the second time. As a professional sound engineer for over 20 years, I have dealt with almost every bass amp on the market and have come to a few conclusions as to what would work for me. Foremost in my mind was to get the most accurate sound straight from the bass sent to the mixing board. Most bass amps have an output for this purpose, and it’ll usually be switchable so as to bypass the amp’s graphic EQ or other tone modifiers, but none of them are as close to the source as I would like. When confronted with the ugly tone many amps are forced to produce as a crutch for bad players, the next best option is to use a “Direct Box” between the instrument and amp. This is a simple box with a transformer that converts a high impedance instrument’s signal to the low impedance preferred by mixing boards, while also providing a hard-wired ¼” output to the amp. 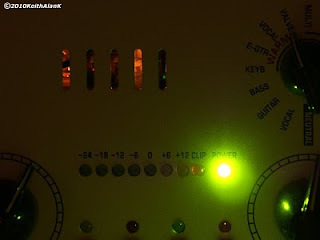 They don’t affect the player’s tone onstage, but they also don’t give the engineer a surplus of signal to work with and are as low-tech as it gets. 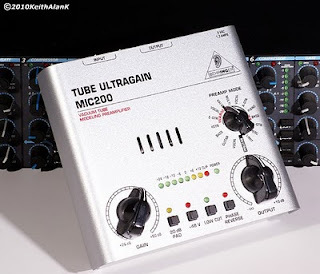 While taking a crap a few months back I was reading my B&H PhotoVideo catalog and stumbled upon a neat little device I had never seen before, the Behringer Tube UltraGain MIC200 Preamp/Direct Box. Getting right to the heart of the matter, this little box rocks. It has ALL of the features of the very best direct boxes, then goes to 11 by not only including a 12AX7 vacuum tube in the signal path but also giving the user voicing options and a limiter. For those who don’t know about such things, a 12AX7 tube is the heart of most of the greatest sounding guitar amps since the 1950s. If you crank up the input gain and send too much signal into one of these, it’ll get a bit hotter to the touch and might distort a bit, but the distortion will be very pleasing to the ears compared with what happens in a solid state device: even-order harmonics instead of the much harsher-sounding odd-order harmonics. I already have some speaker cabinets, so all I need now is a power amp to complete my rig. 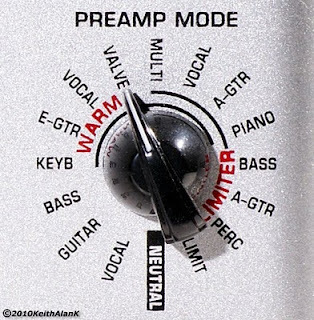 For people who have a ProTools-based recording environment, this is an easy and affordable way to get some analog warmth without sacrificing signal integrity. Using mine in both a recording and live environment I can report complete satisfaction. Since I only play active basses with 3-band EQs, it was easy to get an amazing tone through the front-of-house system while also enjoying better sound than usual through my borrowed stage amp. Standing in front of my band Loud Nine’s Crown-powered Peavey FOH speakers (SP4 & FH18) I noticed that my bass tone was far superior to anything I had heard previously. Clean, precise, solid, and I can get it to growl with the twist of one retro-looking knob. Negative Points are awarded to the 8 voicings that use Behringer’s limiter (right side of the knob). It is much too slow to respond, so the first 4 notes of a song will be way too loud before it clamps down on the output level. If you buy one of these I strongly recommend visiting your local Goodwill or other thrift store to locate a spare 9vAC/1.3amp+ wall-wart power supply with the proper connector and polarity. Because I use several Alesis products I’m very aware of the need to keep spare power supplies with me when they are 9volt AC compared to the more reliable DC units. I have used many of Behringer's products over the last 10+ years with great results. They do what they're supposed to do and at much lower prices than the competition. However, their gear doesn't stand up to the abuse of touring very well. Mixing boards have had multiple channels die, stereo compressors have become mono compressors, and a failed crossover nearly ruined a show. Bottom line is that the German design is fantastic, while the Chinese manufacturing can be improved. My MIC200 travels in a padded case and sits on a sticky rubber mat to keep it from vibrating off the amp and hitting the floor. Got mine from B&H for $40 with free shipping. (ART sells a similar unit for more, and plain direct boxes with none of it's features also can cost more). The MIC100 model omits the voicings knob, and goes for $30. These units represent a significant value, and I recommend them highly. have one and love it. try it in front of EH's new 22 watt stompbox size amp for a no frills setup. agree with you about the manufacturing quality. just buy a padded carrier to store it in when traveling. I also have one of these which I use for vocals/bass straight into my computer Delta 1010LT card. Does a great job and has phantom power for condenser mics. I preferred this over a M-Audio Fast Track Pro (which I though had a very weak pre-amp). I've been using this unit with my pedal steel guitar with great results. I use it on the "warm keyboard" setting, and it seems to wake up the sound and add an edge (harmonics?) to the timbre of the strings. Anyone know which brand of 12ax7 Behringer uses in this unit? Like Anonymous (3) I soon found out that the "Warm Keyboard" preset was the best for my needs. There seems to be more lows than the "Bass" presets, and overall I found the response to be flatter across the spectrum. No idea what brand of tube it uses, but you can bet it's made in China. At least it's "Hand Selected", although that could mean anything from being tested on elaborate gear to getting plucked out of a bin by hand. Jacked into it one day and nothing. Nada. Zilch. Bought a new valve (tube? ugh!) but no cigar. Hey guys, it's a Behringer. You know what to expect.